"This is our one and only chance at mortal life—here and now. The longer we live, the greater is our realization that it is brief. Opportunities come, and then they are gone. I believe that among the greatest lessons we are to learn in this short sojourn upon the earth are lessons that help us distinguish between what is important and what is not. I plead with you not to let those most important things pass you by as you plan for that illusive and non-existent future when you will have time to do all that you want to do. Instead, find joy in the journey—now. If you have children who are grown and gone, in all likelihood you have occasionally felt pangs of loss and the recognition that you didn’t appreciate that time of life as much as you should have. Of course, there is no going back, but only forward. Rather than dwelling on the past, we should make the most of today, of the here and now, doing all we can to provide pleasant memories for the future. If you are still in the process of raising children, be aware that the tiny fingerprints that show up on almost every newly cleaned surface, the toys scattered about the house, the piles and piles of laundry to be tackled will disappear all too soon and that you will—to your surprise—miss them profoundly." I have to constantly remind myself to be in the moment. To laugh and enjoy my children. To help them feel important and loved. It's a challenge, I don't always succeed, but I'm doing the best I can. We wanted to go tide pooling, after a little research, we decided to go to Cabrillo National Park. The kids used my gym card that goes on the key chain to scrap these suckers off. Apparently they don't like that. We read it on the way out. Oops. We did find lots of crabs. No luck on star fish or octopus. The kids could have stayed for hours. They also had a lighthouse to tour, which was interesting. After viewing the lighthouse, Kade was quite upset that we weren't going back to the tide pools. Brandon was alright with it. He was pretty sure a crab was going to bite his toes. I am loving the weather. I am usually a cranky, grouchy lady by this time of year. I needed to get some pictures of my own children to fill my many empty frames. for FHE we went to this cute new park and awesome future photography location. When I stumbled upon it, my heart went pitter patter and I knew we must return. I only made them suffer through about 10 minutes of grief. That's all they would allow me. But I am so happy, because I got something. Which is better than what I had! Come to find out, my older kids had been here with the Robbs, Berkabiles and Reils. It is known to them as the "spinny park" They were thrilled to play. Later, to my surprise, Lauren willingly let me do a solo mini session with her. I'll share more of those later. We took the kids out last week to do the children's hike at red rock. We mainly wanted to see if Brandon could hang. I did NOT want to have to carry him the entire way. The kids had a blast. It was a nice cool day, they explored the wildlife, got some exercise and enjoyed the outdoors. Brandon was in heaven. He took off and we didn't have to hold him at all. There were times we had to hold him back because he was so excited! Kyle was grouchy because the hike wasn't longer! When we arrived back at the car, we were enjoying our sandwiches and noticed bighorn sheep across from us on the mountainside. Too bad I don't have a working zoom lens. My brother Russell and his wife Caitlin were down for the weekend. Apparently the boys (Russell & Ryan) had a ninja competition. I sure would have liked to see Russell in his get up. I was envisioning Nacho Libre. A wild fit of laughter was Russell's response. Well, not that wild. I guess it's just your regular karate type outfit. Ryan placed first in his division and won a sword. Russell was not as lucky :( Next time. It was great to see both of them and Otis. We were assured that he weighs the same, but his face looks older to me. It took Brandon a little while to warm up to him. Caitlin brought along a little game that she saw on the Ellen show. I've misplaced the clip and can't seem to locate it. Anyways, they put these nylon socks on their heads with a tennis ball stuffed down toward the toe. They are supposed to not use hands and swing them like a helicopter, trying to grab their opponents ball and pull the sock off the face. We thought we were gonna die from laughter. It was close to pee your pants laughter. What's better on a Sunday afternoon than silly kids, running dogs, good company and beautiful weather? It was a LONG trip up. We stopped in Cedar to see Lauren do her play at SUU for the Shakespearean festival. Then we hopped over to get back into the great state of Nevada. We went through Panaca and up past Pioche and Caliente then over close to the border of Utah/Nevada near Baker then up to the Lehman Caves campgrounds. We had a relatively easy trip up. Brandon was content to just watch TV. We acquired a couple of extra portable DVD players when we flew last month to Washington. There were lots of options and everyone was happy. We could barely see poor, little Kade in the backseat. We had stuff jammed all around his carseat. One time I said, "Kade I miss you way back there." He said, "Mom, I'm just right here! There was no where to stop. The road was well.....straight! There were some towns, but if you blinked, you might miss them. Lots and lots of desert. Actually when we pulled up into the great little town of Baker, it was still desert, and I was fearing that we were going to be camping in it. No worries, there were trees. So all was good. We tried to get some money in Baker, but there were no ATMs. Are you flipping kidding me? The more I thought about that town, the more depressed I got. I thought about the fine folks that chose to call that place home. What would cause one to live out in the boonies. Ugly boonies no less? Makes you wonder. Made me happy to call Las Vegas home. We had to stop at this very interesting store in the middle of NOWHERE to get some cash. There was a grandma watching a baby while drinking her beer outside of the bar I would assume. Lots of really, really dirty teenagers. I think they were homeless. They looked that dirty. A pack of them with bikes and sleeping bags and did I mention filthy clothes? Made me sad! Yummy dutch oven cooking every night. A small stream behind the campsite. Falling asleep with the running water in the background. Fishing! Each of the kids caught their own fish. That doesn't always happen for us. So it was a good time. Kade LOVES the show Little Bear. He wanted us to go home and make him some "fish soup" just like Little Bear eats. Come to find out, Kade can't stand fish. Steve falling in the COLD creek. The water went up to his shoulders. Lauren was freaking out (she was sure he would die), Kyle was laughing, and I couldn't figure out if he was hurt or just cold. It was kinda embarrassing for him, luckily we were the only ones there. I told him the kids would be talking about that little incident for YEARS! Visiting the caves. It was pretty cool. Nice for the big kids, not so nice for the little kids. Apparently you can't touch a THING because the oils from your hands will cause damage to the formations. Brandon was especially difficult, lots of screaming, a not so understanding tour guide, frustrated Dad and Mom. Glad we went though. A deer that walked right through the campground to eat. Was not scared in the least. Wishing Lauren a happy 10th birthday! The long ride with lack of scenery. Telling the kids every other sentence to STAY OUT OF THE FIRE....WATCH OUT FOR THE COALS....HOT! Losing my cool a few times. Having Lauren tell me I am grouchy. Hello.....I thought that I was pleasant. I was trying very hard to be pleasant! Being squished between Brandon and Kade on an air mattress that was loosing air. Dirty feet, faces, clothes, fingernails. Constantly trying to keep someone clean. Taking down camp in the rain. Steve taking a winding dirt road to try and find a ghost town. Do you know what the best part was though.....coming home and taking a shower! Heaven! The camping experience. I almost have all the dirt out from underneath my fingernails, the inside of the car is cleaned, and the laundry is done and folded. Feels SO GOOD to be home. If only my kitchen was stocked, life would be perfect. More about our trip later. We made some memories, that's for sure! We spent the afternoon at Steve's parents' house. They were out of town, so we joined his sister and had the pool to ourselves. Our kids were in heaven! Lots of water splashing, dunking, jumping....you know, the usual. We had a simple, tasty BBQ and then drove ourselves home to enjoy some fireworks. I always forget how LATE it gets before we can shoot those things off and so hot to boot. I was determined to get a good firework shot, so I was neglecting my poor little Brandon. Last year, we watched the fireworks together through the sliding door since he was so frightened. This year he was braver but took matters into his own hands by climbing over the backseat of the car and hiding whenever the fireworks made loud noises. It was adorable. I did not take nearly as many pictures as I would have liked. I was too busy chasing after little boys. I was most concerned about the flight. That my friends was the easiest part of our travels. When we arrived at the ticketing booth in LV, it was so backed up we feared we would miss our flight. Apparently the computer system was down. Thankfully they called passengers out of line according to the time of departure. The nice lady at the counter went ahead and assigned us seats for both flights. I was so relieved as I thought our children would be spread out all over the place. Brandon was overtired and the Benadryl had not quite kicked in yet. I had to hold his strong, fit throwing body down. Once we got to the tinest airport I've ever seen, we had drama with the car rental company. I had a reservation with carseats and apparently they don't take debit cards, even if it acts as a credit card. Nice of them to tell us. After hopping around from counter to counter, others took debits, they just didn't have what we needed. Some had all their vans rented out others no car seats. I was HOT! So mad at the Hertz people. Finally Avis came through for us. Thank goodness! It is so green. I know we were on the desert side of Washington, but it was still pretty. The Tricities area reminded us of a small town. Seemed pretty cool. Steve passed by the house where they used to come to visit Grandpa and Grandma McClellan. I really wanted to cut my arm off. The muscles were so sore from picking and carrying kids, luggage you name it. The pullout bed in the Comfort Inn was so thin the kids were having fits about it. Steve and I both took a night sleeping on it, so it would be FAIR. They were right, it was pokey. Not the most comfortable of beds. Kyle leaving his flip flops to walk a few miles up to fish. His poor feet were tore up plus he got a pretty good sized sliver. Running and playing with cousins. Grandpa Bruce's cowboy poetry at the talent show. Celebrating Grandma McClellan's 80th birthday. We saw lots of orchards, some sheep, cows and a horse. Swam and waded in the Columbia River. The kids hunted for clams. Watched old photographs in the form of a video highlighting the life of Grandma. It was pretty cool. Steve told Kade to pee behind a tree. He made it a point to go back to that same tree all day! It was nice having a minivan. It is definitely much easier to buckle kids up and helps with the in and out of the car. We have never owned a minivan, it was almost like driving a car. We sure did buy a carseat for the return flight. It was so much easier. He still had a meltdown, but I didn't have to hold him in. Steve's brothers, Mike and Doug, missing the flight home and having to wait until Tuesday evening. Fighting the crowds at the airport. We were grouchy travelers. It was hard keeping our rowdy bunch together. When I am an 80 year old grandma, I want to be just like Grandma McClellan. She is so independent. She still drives, works at the temple, travels, reads, is in good shape, is gracious and kind and knows just the right things to say. She is a delight. 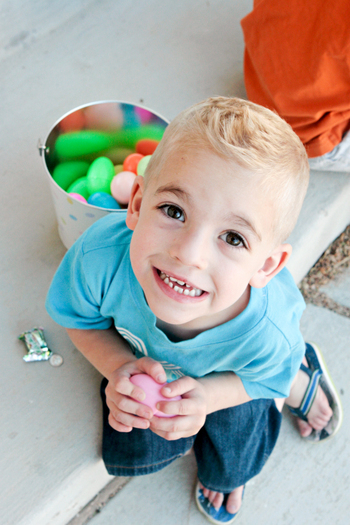 egg hunts, good food, fun with the family. Steve forgot to set the alarm, so we woke up rather late to make our 9am church. Then once we made it to the car, discovered that it would not start. Steve played with a few connections and viola we were off. Nothing like a few setbacks to make life interesting.